The photo below was taken in 1936 during the launch of a German army vessel, a ceremony that was attended by Adolf Hitler himself. What made this photo iconic was the fact that a lone man stood in defiance, with his arms crossed, amidst men who held up their arms in ‘Sieg Heil’ as a sign of allegiance to the Nazi Party and its leader, Adolf Hitler. 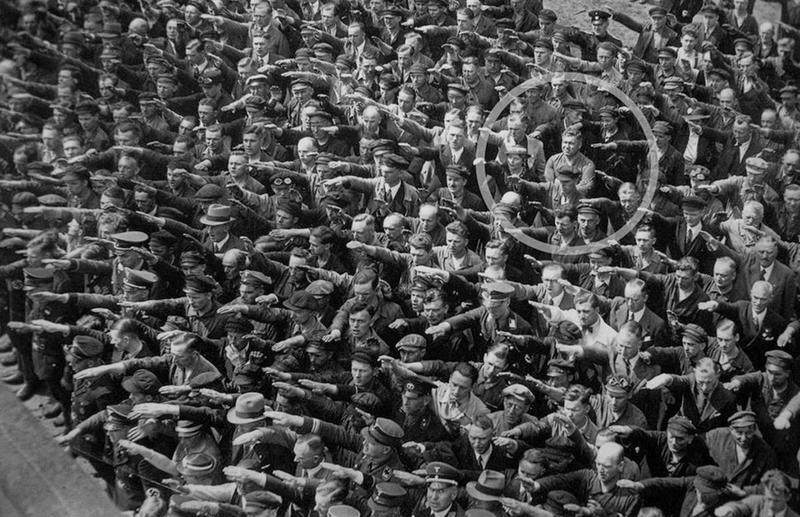 August Landmesser, show his protest and disapproval bravely. The source of Landmesser’s protest, not known to many, starts with a love story. August Landmesser was originally a Nazi supporter. Believing that having the right connections would help him land a job, he joined the Nazi Party in 1931. But fate had a different plan for him when he met Irma Heckler, a Jewish woman, in 1934. Landmesser fell in love with Heckler and the two got engage a year later, which got Landmesser expelled from the party. Their marriage application was also denied. In October of the same year, they had a baby girl they named Ingrid. The family attempted to flee to Denmark in 1937 but they were apprehended at the boarder. Landmesser was arrested and under the Nazi racial law, he was charged for “dishonoring the race.” he argued that neither he nor his wife knew that she was fully Jewish, and was acquitted on the 27th of May 1938 for lack of evidence. He was warned that a repeat offense would land him in prison for several years. 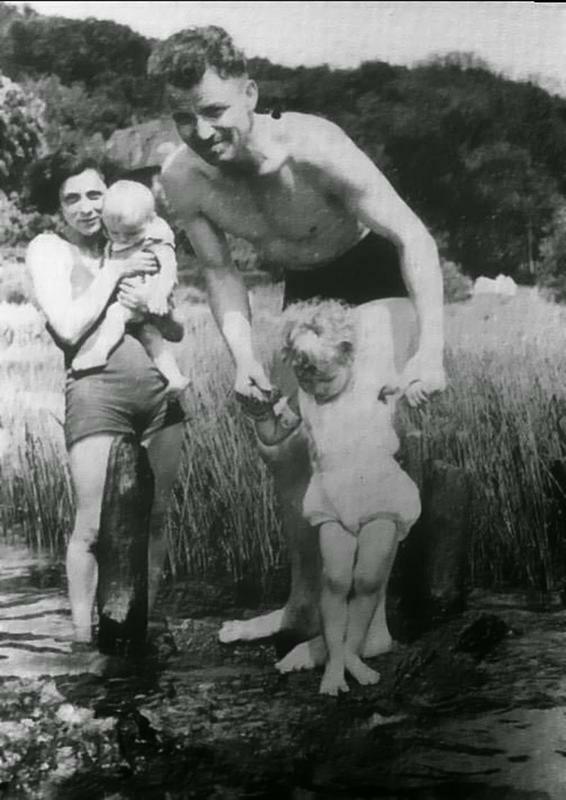 The first and only photo of the family, June 1938. Although it was forbidden for them to meet, they appeared together in public and put themselves at exceptional risk. The couple continued their relationship publicly so a month later August Landmesser was arrested again and sentenced for two years of hard labor in a concentration camp. He would never see his family again. His wife, Irma Heckler was detained by the Gestapo and prisoned in Fuhlsbüttel, where she gave birth to their secind daughter, Irene. The two kids were initially taken to the city orphange, but later on the eldest, Ingrid, was allowed to live with her maternal grandmother; Irene was sent to the home of a foster family in 1941. In 1953, after the death of her grandmother, Ingrid was also sent to foster parents. Their mother sent the two kids a few letters until January 1942. The letter stopped coming as it was believed that she was taken to the Bernburg Euthanasia Center in February 1942, where she was among the 14,000 killed. August Landmesser was released in 1941 and began working as a foreman. Two years later, he would be drafted into a penal infrantry along with thousands of other men. he would go missing in Croatia, just six months before the official surrender of Germany. His body was never recovered. In the course of post-war documentation, both August Landmesser and Irma Eckler would be proclaimed legally dead in 1949. --In 1951, the Senate of Hamburg recognized the marriage of August Landmesser and Irma Eckler. Their daughter Ingrid took their father’s name, while Irene keep their mother’s. --In 1996, Irene Eckler published the book “The Guardian Documents 1935 - 1958: Persecution of a Family for “Dishonoring the Race”. The book which talks about the story of her family include a original documents from the time in question, as well as letters from her mother and documents from state institutions. --The iconic photo of August Landmesser refusing to fot the Sieg Heil was first published on March 22, 1991 in Die Zeit. The version with the circle is the original copy. --The ship that was launched and everyone was saluting, the “Horst Wessel”, was claimed by the US as a war prize after WWII. it was renamed “Eagle” and recommissioned as a Coast Guard Cutter. The ship is still in service.